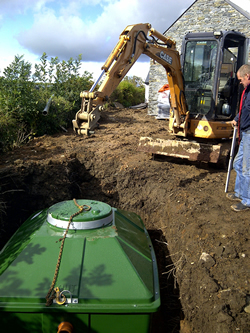 At AEROTANK we are proud to be leading the way in the Sewage Treatment industry with our innovative products manufactured in the countryside for the countryside. 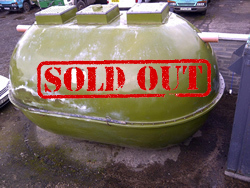 The basic Aerotank is known as the 6P 95%. The 6P indicates the maximum number of people served by the treatment tank and the 95% is the standard of water when it leaves the system after being fully treated. This 6P system is sometimes known as a 5 bedroom tank as the recognised population of a five bedroom dwelling is 6 persons. As set out above, Aerotanks are designed to provide you with the option of standards of water quality with the 95% standard being the most commonly used and the 97.5% system becoming increasingly more popular. Finally, the 98% system is available and is generally specified for environments of high sensitivity or special scientific interest. 30,000 litre sewage treatment system (10 house tank/50 pop domestic/150 pop commercial or industrial). Has previously been installed on site but NEVER connected to any sewerage system as the small housing development never made it to completion. The slight discolouration is purely cosmetic and in no way affects the tanks operation or quality. Can be sold as a bare shell, or as a complete unit including on-site commissioning. As Northern Ireland's only manufacturer, you can relax in the knowledge that you will receive a 100% satisfaction rate.